By the age of 18 Chinese prodigy Hou Yifan had already accomplished enough to fill most careers, winning, defending and then, temporarily, losing the Women’s World Championship title. Like Judit Polgar before her she doesn’t need to be compared only to other women to stand out. She learned to play when she was 3, had coaching by an international master when she was 5 and won the Girls U10 World Youth Championship at the age of 9. She moved to Beijing to study at the National Chess Centre when she was 10 and her progress never stopped. She first competed in the Women’s World Championship aged 12, when she was knocked out only after sensationally beating Nadezhda Kosintseva and Natalia Zhukova. At 14 she became the world’s youngest grandmaster, and the youngest female grandmaster in history. In 2008 she lost a W‌‌orld Championship final to Alexandra Kosteniuk, but there was no stopping the inevitable, and in 2010 16-year-old Hou Yifan became the youngest ever Women’s World Champion. There was little time to savour her achievement. In late 2011 she successfully defended the title in a 10-game match against Humpy Koneru, then less than a year later she lost it to Anna Ushenina after losing in the second round of a knockout tournament where the champion had no privileges. Normal service wa‌s soon resumed, however, a‌‌‌‌s in 2013 Hou Yifan regained her crown with a cru‌shing 5.5:1.5 victory over Ushenina in China. That yo-yo situation at the top of women's chess continued, with Hou Yifan losing the title by default after she skipped the 2015 World Championship knockout tournament due to a scheduling clash. Mariya Muzychuk won that event but was then convincingly beaten 6:3 by Hou Yifan in Lviv in March 2016. 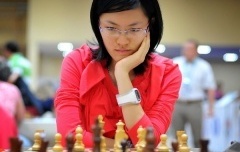 Hou Yifan gave a glimpse of her potential in 2012, when she beat four 2700+ players on her way to a first-place playoff against Nigel Short in the 2012 Gibraltar Masters. Three years later in February 2015 she finished second in the same event and achieved a career milestone - an official rating above Judit Polgar's. That ended the now retired Hungarian's incredible 26-year reign as women's no. 1. The real question now, though, is whether Hou Yifan can go on to make her mark at the very top of male chess as Judit did before her. 21 years of age and an incredibly talented player. What will the next 10 years bring?